Come and join this private tour where you can experience a traditional Kabuki performance during the afternoon. Kabuki is one of Japan traditional stage arts with over 300 years of history. What makes Kabuki theatre so interesting is not just their exaggerated makeup, outlandish wigs, and their costumes but the stage that they perform also moves to match the Kabuki's acting. Enjoy the Japanese culture with a first class seat. There is a maximum group size of 6 people. Hop-on to a private vehicle and have a first class seat at the Kabuki theatre and enjoy the professional Kabuki entertainment. Kabuki is one of the traditional stage arts in Japan. The main fact which makes Kabuki very famous is its well-designed costumes, eye-catching makeup, outlandish wigs, and arguably most importantly, the exaggerated actions performed by the actors. Also, the dynamic stage sets make Kabuki show more impressive. There are many specialty tools used by only Kabuki's such as trapdoors and the stage platform revolves making the Kabuki's actions even more impactful. This ticket is not on the market yet and it is very hard for people to buy it. However, it is possible to obtain this ticket. A private transfer will be provided to go to the Kabuki theater without worrying about getting lost along the way. 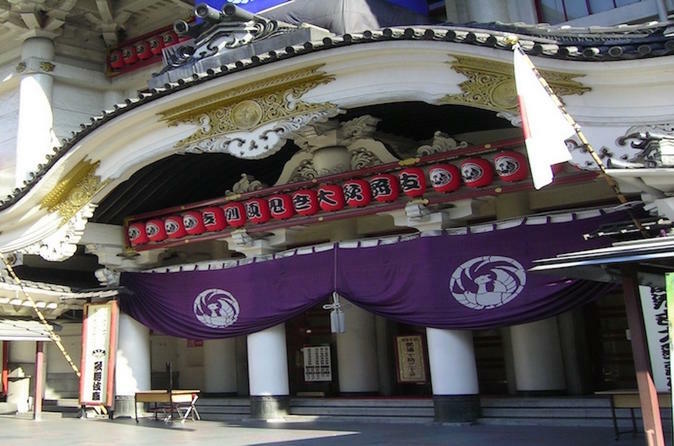 Come and join this Kabuki watching tour, and experience a traditional Japanese form of theatrical art.